Tomorrow is the big day: election day in the UK and tomorrow evening is likely to be the most exciting (as exciting as watching people talk about numbers and politics can be) election night in a long time, especially if the media's predictions of a hung parliament are anything to go by. 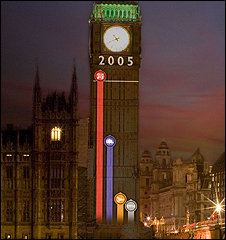 To add to the excitement and suspense, the BBC will, for the first time, project the results of the election on to the side of St Stephen's Tower, which houses Big Ben, from the moment the first results come in until about 5:30am on Friday morning. The number of seats won by the three largest Westminster parties will be updated as the results come in. Sadly, there are some killjoys out there who won't be continuing in the tradition of counting the votes on the night but they're few and far between so the result projected should give everyone a good idea of the final outcome come 5:30am. I don't think I'll watch the official TV coverage as I think Channel 4's Alternative Election Night coverage may be a better watch, but I'll certainly be keeping an eye out on the results with the occasional peek at Big Ben (via the BBC - I can't see Big Ben from the edge of Reading) just to see how well this will work and also to satiate my curiosity on the outcome. Thanks to the beauty of the postal vote system I've already cast my vote.